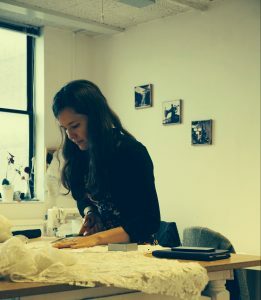 Born in Edinburgh in 1985, Gemma’s love of sewing began at a very young age when she started helping her mother design and make costumes for her dance competitions. Gemma studied at Heriot Watt University’s School of Textiles and Design and graduated in 2007 with a first class honours degree in Bsc Clothing Design and Manufacture. Throughout her degree she won numerous University prizes including the Ede and Ravenscroft Award (2004), the Lenzing Prize (2006) and the University Prize for outstanding merit (2004, 2006). In 2005 Gemma completed a six month work-placement with Glyndebourne Opera House where she worked as a Junior Assistant in both the Ladies Costume and Men’s Tailoring workrooms gaining training in corsetry and bespoke tailoring. After graduating, Gemma worked in several roles within fabric retail and with local bridal boutiques in addition to part-time commitments as a freelance designer and dressmaker. In 2008 Gemma acquired a studio space within St Margaret’s House (now part of Edinburgh Palette) which enabled her to begin establishing her business. Gemma’s varied business activity at this stage included providing a complete bespoke clothing design service, dressmaking and alterations and private sewing and pattern cutting tuition. 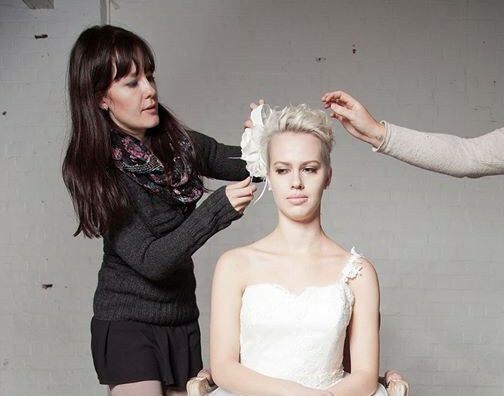 Since 2008, Gemma has grown her business considerably and today her design studio focuses on the creation of couture and made-to-order bridal, formal wear and accessories. All Gemma’s items are designed and handmade in Scotland from the Edinburgh design studio. 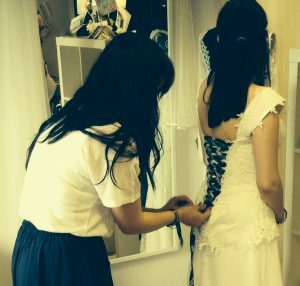 All Dress fittings andconsultations take place in the Edinburgh Studio which is filled with sample garments and accessories, fabric, trims, crystals and beads, appliques, embellishments and lace to inspire you for the design of your own unique dress and accessories. Gemma works closely with each individual listening to their needs, transforming their ideas into truly unique garments that will fit perfectly and be treasured forever. Additionally, Gemma offers a five star, professional bridal and formal wear alterations service which includes the customisation and re-styling of wedding dresses and the creation of co-ordinating accessories in addition to tailoring each dress to fit. To discuss having a bespoke bridal gown, evening dress or accessory created, view our made-to-order collection or enquire about our bridal alterations service please contact the studio and we will be more than happy to help.